The Overcontroller (OC) is an overcompensatory coping mode designed to create as much distance as possible from feelings of vulnerability, through cultivating a sense of being ‘on top’ or ‘in control’. This ‘distancing’ process takes place through a number of mechanisms, including perfectionism, obsessional rituals, rumination/overanalyzing, superstitious thinking and a focus on rules and regulations at the expense of health, happiness and human connection. This mode functions as a ‘tight rein’ or self-generated ‘overprotective parent’, designed to keep oneself in check, whilst eliminating emotions and needs that may evoke criticism or shame. 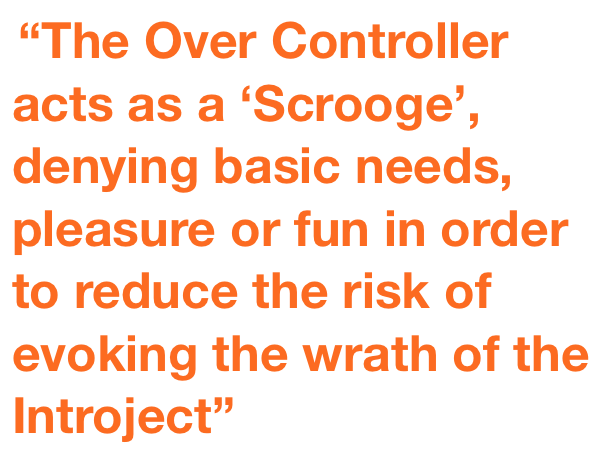 The OC acts as a ‘Scrooge’, denying basic needs, pleasure or fun in order to reduce the risk of evoking the wrath of the Introject [Critical] mode. It advocates for a minimalist lifestyle of self-discipline, ascetism, self-inflicted austerity and stoic tolerance of adversity. Basic human needs such as sleep, eating, rest, are dismissed as ‘dead-time’ or a sign of self-indulgence, with relaxation strictly only allowable after all duties have been completed. The most commonly identified ‘face’ of this mode is the Perfectionistic Overcontroller. Generally, the child has learned to submit to the expectations of others through striving for perfection and working hard, in the hope that this will lead to approval/acceptance. The OC is never satisfied – the striving nature of the OC means that the goal posts keep changing, and nothing the person achieves is ever quite enough. It achieves its goals through several interchangeable targets, such as school grades/work, exercise/athleticism, restrictive eating/weight/shape. Other ‘faces’ of the OC mode include the Flagellating [or Scolding] Overcontroller, Suspicious Over controller andInvincible Overcontroller. The OC mode tends to be highly ego-syntonic, rigid, and split-off from the other modes. 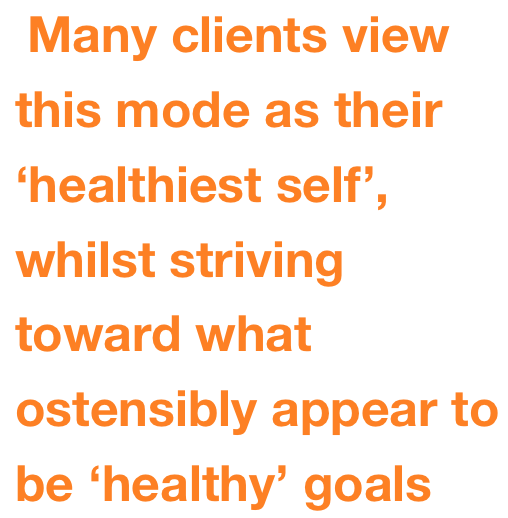 Many clients view this mode as their ‘healthiest self’, whilst striving toward what ostensibly appear to be ‘healthy’ goals (e.g. to be productive, fit, athletic, orderly, rational, successful). In therapy, the OC mode generally resists experiential work and insists on quick-fix [intellectually focused) solutions. 2.Identify specific functions of OC mode within the context of clients’ individualised mode maps. Use Pros/Cons exercise to first uncover the significant secondary gains provided by this mode, and then explore possible disadvantages (including lack of connection and authenticity in relationships; damaging effects of risky behaviour on physical health; loneliness; depression; blocking capacity to get emotional needs met). Explore whether other family members have an OC mode and its effect on relationships. 3.Self-monitoring serves the dual purpose of giving the OC mode a job (i.e. exploiting the functional aspects of the mode), whilst facilitating awareness of the presence of this mode in daily life. Tracking the modes facilitates de-fusion by promoting awareness of the whole range of modes that make up their identity. Use monitoring forms to identify triggers and signs of the mode, including habitual cognitive patterns and specific language or words used by this mode, physical posture, facial expression felt-sense, and behavioural compulsions. 4.Bring OC mode to the client’s awareness when it appears in sessions. Don’t be drawn in by intellectually stimulating or overanalyzing stories that leave you feeling bamboozled and distract you from ‘seeing’ and labelling the OC mode. 5.Interview the OC mode on a separate chair, asking when it first came into the client’s life and what role it played. This can help to uncover early functions such as providing a sense of achievement, approval, control, self-worth or safety within an unpredictable family environment, and the seductively tangible promise of happiness which will appear once all rules have been followed and goals (which are continually re-set) have been reached. 6.Use empathic confrontation: use self-disclosureto gently explain the effect of the OC mode on the therapeutic relationship, whilst acknowledging the past survival value of this behaviour, and exploring its effect on other important relationships. Explore how the OC mode impedes getting needs met in current relationships. oExplore differences between HA and OC mode: e.g. adaptive vs. maladaptive perfectionistic striving, flexible vs. all-or-nothing thinking, compassionate vs. duty-bound etc. 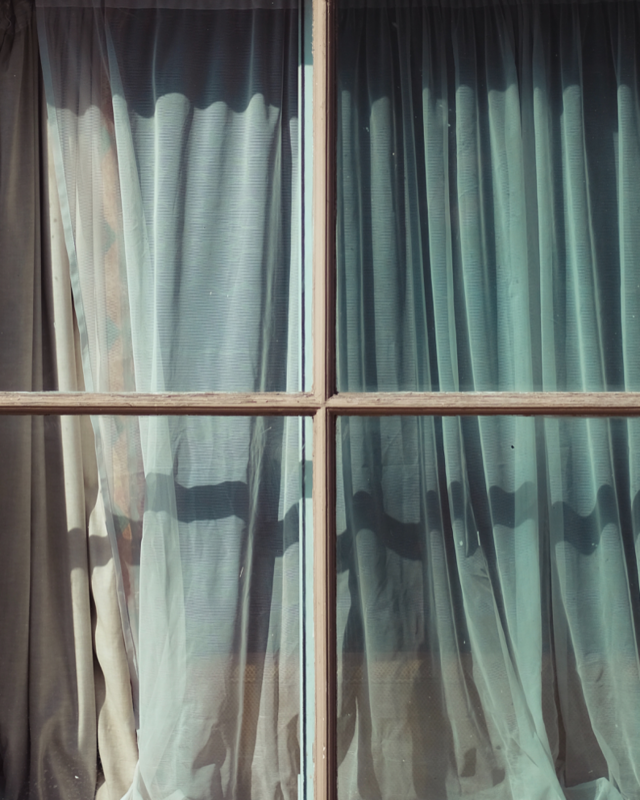 oUse modelling and self-disclosure – whereby the therapist describes instances in their own life where they have chosen HA rather than OC mode responses (e.g. at work, parenting etc.). oReplacing OC with HA mode can be viewed by some clients as settling for ‘mediocrity’, thereby posing the risk of feeling invisible and powerless once again. Finding a label for the HA such as ‘Wise’ or ‘Compassionate’ self can feel more acceptable, especially if this is linked to concrete examples of people whom they perceive to be both successful and wise. oAsk clients to draw pictures of the OC and the HA modes that depict their differing core messages, purpose, ‘tone’ and felt-sense. oPersistently validate instances of even the tiniest expression of emotion, thereby counteracting internalized messages that needs and emotions are shameful and should be avoided. oFind a strong, compassionate symbol (e.g. cultural or spiritual symbols, animals), to be used as a reminder to connect with their HA rather than the strict OC side. oUse photographs of client as a young child to use in sessions as a reminder that this mode exists (especially when the OC mode insists that there is no Vulnerable mode). oThrough limited reparenting imagery, the Vulnerable Child can be encouraged to trust in the HA and relinquish their strong attachment to the OC mode. The therapist repeatedly gives the Vulnerable Child the message that she is no longer invisible, but that she is seen and valued for who she is rather than for what she has achieved. 9) Use chair work and imagery rescripting to reduce the strength of the OC and to allow the therapist access to the Vulnerable Child for reparenting work. Early in therapy the OC mode can be so strong that the client refuses to participate in chair work. In this case, the therapist can play the role of all of the different modes, moving between chairs and drawing the client in by asking for help with the messages from each of the modes. The VC’s fear of letting go can also be acknowledged e.g. VC: “I’m scared to let you go, but I don’t want to keep feeling this way. You don’t realise it, but when you deny me what I need, it makes me desperate and then I want to binge/drink/etc. even more….I need you to relax a bit and let me lean on [therapist] so I can get what I really need. I need to be heard. I need someone to care. I feel so alone like this…”. 10) If the VC ‘clings’ to the OC mode and expresses distress at the prospect of letting go, the therapist validates this, and explains that this is normal (even a strict/stingy foster parent is better than none at all), but also invites the child mode to learn to trust their own HA, explaining that although in the past being controlled felt safe, she can never thrive until she gets the nourishment she really needs. Dialogue between OC mode and HA (Bypassing the OC mode) E.g. HA: What makes [Carol] special is her lovely nature, her natural cleverness, her caring, gentle nature, her kindness....not proving that she is good at starving herself. There are lots of people who starve themselves...[Carol] is special because of her own unique personality. HA: Little [Carol] needs connection, love, presence - not starvation. You are the one who is driving the AN, because you want to show how good you are at overriding basic human needs - but that is not what little [Carol] really needs. She has nothing to prove, she is beautiful already, just the way she is. I know you have her best intentions at heart, but you were only ever meant to be a stop-gap. Keeping her in a cage is harmful to her health. Can you practice letting go of a tiny bit of one aspect of her life, so that her HA side can have a turn? I believe you have the courage to do this, even though it’s scary, because I know you want the best for her. Be aware that waiting ‘in the wings’ behind the OC is the Introject [Critical] mode. The Critic often becomes vocal once the OC mode has been bypassed. The focus of chair work then shifts directly toward identifying, challenging and sending it away. Bring in a new chair for each new mode that appears during chair work. 10.Mindfulness is the opposite of the OC mode – as it is focused on ‘being’ in the moment, in the body, rather than ‘doing’. In OC mode, the body only exists as transport for the head. Therefore, the OC will find many distractions in order to avoid being in touch with the body. Mindfulness practice can bypass the OC mode by cultivating awareness. Moreover, it anchors the person to the experience of being in the body, which in turn facilitates recognition and eventually acceptance, of vulnerability and needs (both physical and emotional). Due to the OC’s inability to tolerate non-productivity, alongside a general lack of tolerance for ‘feeling’, it is suggested that a very short daily practice of 2-5 minutes is introduced. Clients are encouraged to specifically focus on noticing and jotting down (or voice recording) all of the ‘ploys’ used by the OC mode to try to escape the task. This gives the OC a productive ‘job’ to do alongside the mindfulness….by allowing it to engage in its favourite activity…making lists! One word of caution…in some cases mindfulness can be used as a mechanism for further avoidance, so it is important to ensure that mindfulness of difficult or ‘messy’ emotions is on the agenda. 11.To strengthen the compassionate focus of HA mode (the antithesis of the strict OC mode), set specific mindfulness-based self-compassion exercises. 12.Over time, future-oriented imagery work can focus on dealing with stressful daily triggers. This involves visualizing typical situations and relationships where the OC arises, and practicing making the switch from the OC to the HA mode, whilst noticing concomitant changes in breath, posture, voice tone, and self-talk. Clients can be helped to stay anchored to their bodies by reminding them to notice their breath, and to notice sensations in their body/hands/feet. 13.Introduce fun exercises which are the antithesis of the OC mode, to bring the Spontaneous Playful Child mode to life. The OC mode presents significant challenges, not least because it quite stubbornly refuses to acknowledge the existence of any other modes. It provides a socially acceptable mechanism which provides protection from frightening or ‘shameful’ emotions, whilst generating multiple forms of secondary gain, such as achievement, productivity, success, power, control - all highly valued within our culture. 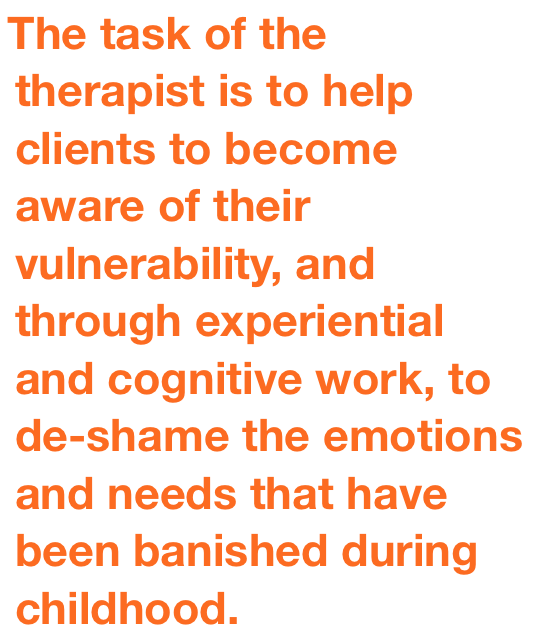 The task of the therapist is to help clients to become aware of their vulnerability, and through experiential and cognitive work, to de-shame the emotions and needs that have been banished during childhood. Through gradually internalizing a Healthy-Self, and the practice of self-compassion, the OC can be transformed, and self-acceptance becomes possible.